This patient hadn't been to a dentist in years and had a medical history that included a motor vehicle accident. She was interested in dentures but because she was so young we were concerned about bone loss on the lower arch if she had to wear dentures the rest of her life. We decided on placing two implants. This achieved retention of the lower denture will maintain the bone quality throughout her life. The patient was very happy with the results and will be able to eat things she wouldn't have been able to with traditional dentures. This patient had a few teeth that needed extracted. He was left with a large "gap" that was making it difficult to chew. We decided on placing three single tooth implants and restoring them with screw retained implant crowns. The patient was very happy with the outcome and now his chewing function has been restored on that side. This patient was seen for an immediate implant placement. 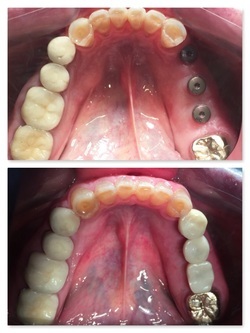 In this case we were able to do a temporary implant crown for the patient the same day. This way he had the tooth extracted, the implant placed and did not have to leave the office without a front tooth. Another advantage of a temporary implant crown is that patients no longer need a “flipper” that has to be taken in and out especially when trying to eat. This temporary will only be used while the implant is healing. A permanent crown will be fabricated once the implant is completely healed. This patient was seen for our combination in-office/take home professional teeth whitening system. It is called Smile Perfected. The treatment only takes 20 minutes in office and is best done directly after your cleaning. It causes zero sensitivity. Most patients will notice a brighter smile when leaving the office but the great thing about this system is you are provided with a take home mouth piece that will allow you to continue whitening for 30 days. It is important to follow the take home directions and to stay consistent with the applications. to be re-done due to chipping and decay. The composite is also sometimes hard to match the exact shade. You can see from the before picture the color difference of the front teeth. We decided because of the size of the composite veneers and the evidence of new decay, that we would do cosmetic full porcelain crowns. This would allow the front teeth to function better and look more natural. This patient was seen by our laboratory here in Columbus so that we could match the shade of her two front teeth exactly. We were thrilled with the outcome. This patient was concerned about a fractured crown and decay on her front teeth. We were able to use tooth colored porcelain crowns to adequately restore the function and esthetics. We also had this patient seen at our local laboratory in Columbus to have the porcelain custom matched to her existing teeth. This patient was unhappy with the existing veneers on her front teeth. They were not in a proportionate relation to her other teeth. We decided to replace the veneers and give the teeth a better overall appearance. Custom shade matching at our laboratory was done in this case as well. This patient had existing composite fillings that were breaking down and starting to decay. She was also not happy with the way her canine on the left “stuck out.” By placing full porcelain crowns on these teeth we were able to protect the teeth from breaking down even more and we were able to greatly improve the esthetics. As with all of our cosmetic cases, this patient was seen at our local laboratory for a custom shade match. This patient underwent Invisalign therapy in our office and was treated in less than 12 months.